Here’s some serious German technology coming to our shores (after production starts in 2010): Volkswagen’s upcoming Touareg with a supercharged V6 and hybrid drivetrain cranking out 374 HP and giving back 26mpg. Those are some impressive figures, especially for a big and heavy SUV. The upcoming Touareg V6 TSI Hybrid uses VW’s new supercharged 3.0-liter V6 TSI petrol engine producing 333HP that is combined with a 52HP electric motor installed between the V6 TSI and a newly developed 8-speed automatic transmission. Curiously, this contrasts with the Touareg ‘s mechanical sibling, the Porsche Cayenne Hybrid that features a normally aspirated 3.6-liter V6 FSI. There’s no word on what the other corporate triplet, Audi, is planning to do with its SUV, the Q7 and whether that will feature a hybrid drive system at all. Anyway, back to the technical goodies in the Touareg. The nickel metal-hydride battery is charged through regenerative braking and is located under the luggage compartment so as not to be obtrusive. 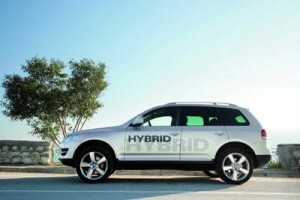 The Touareg can operate on just the electric motor at speeds up to 31 mph. In this case the V6 TSI is turned off, and it is disconnected from the transmission by a disengagement clutch allowing the Touareg V6 TSI Hybrid to operate with zero emissions. Impressive. When you really need to stand on it, the V6 TSI engine and the electric motor operate together (either by kickdown via the peddle or gearshift selector in “S” position) for a combined output of 374HP and a maximum torque of 550 Nm. In this case, the Touareg accelerates to 100 km/h in just 6.8 seconds, which is damn impressive for something that big, and it’s even more impressive with those kinds of mileage numbers. Oh, and in case you’re interested, the beast only puts out less than 210 g/km in CO2 emissions.